I was reading a recent article discussing knee pain and its relationship to weak muscles in the foot, ankle, and hip. 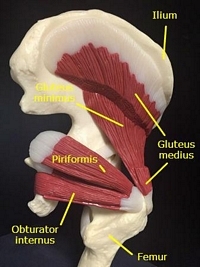 The author was discussing the importance of glute maximus and glute medius for hip stabilization and extension. These strong and powerful hip muscles help with hip extension and stabilization of the pelvis, and weakness leads to a variety of back, hip, knee, and foot injuries. The femur or thigh bone is extended backwards and controlled by the interaction of the hip muscles. With weakness in the lateral hip muscles, we cannot stabilize the femur with our normal walking, running, squatting, and bending motions. Our gait begins to degrade with muscle fatigue. Runners notice a difference in their pace, efficiency, and smoothness near the end of a long run. As the hip muscles are fatiguing they cannot effectively and efficiently stabilize the running gait; and many people experience that pounding sound and stomping sensation. At the end of the marathon you see many people with a Frankenstein-type gait, where they are pounding the pavement to the finish line. Fatigued Frankenstein running gaits are obvious to the tired runner and cheering crowd. Muscle fatigue also happens when we are walking through the mall or parking lot. With hip weakness and fatigue, the femur begins to internally rotate with each step, placing stress on the knee tendons and ligaments. Athletes often experience increased knee injuries, such as ACL tears, ligament sprains, tendinitis, and muscle strains. The average person tends to feel more achiness and stiffness in their knees after long runs. They might have mild pain or “popping” with bending or squatting. Many people find diminished balance or wobbliness when fatigued. They often feel tightness with their hamstrings and feel like they need to sit and rest to recover. In the clinic people often give us a funny look when we make them start doing hip and feet exercises. Eventually they are going to ask why am I doing this because “its my knee that hurts.” The simple answer is their knee hurts because they have weakness in their feet and hip. Whenever a stabilizer muscle is weakened and fatigued, stress and strain will overwhelm the next muscle, tendon, or joint in the gait sequence. Commonly the knees develop internal rotation injuries, such as IT Band, patella tendinitis, or chondromalacia patella because of hip and foot weakness. Treatment goals are to increase strength, endurance, and muscle pattern coordination of all the muscles required for normal walking and running. Runners need to increase strength and endurance to handle all of the running volume and terrain. Our older patients often complain about the exercises because they don't feel like it is directly benefiting their knee pain. I then ask them to pick up 10 golf balls off the ground without hinging at the waist. Many find that they quickly fatigue and are unable to squat after three or four repetitions. The point is quickly proven that they do not have enough hip, knee, and ankle strength to squat as they should. The patients are compensating during their day by hinging at the back; thereby, placing more stress and strain on their lumbar spine and knees. They do not realize that, on long walks through the parking lot and grocery store, they are internally rotating their knee and increasing the ligament and tendon strain. Many feel improvement after several weeks of therapy. They are often amazed how just a few weeks of therapy increases their ability to squat and pick up 10 golf balls, walk through the mall, and climb steps. 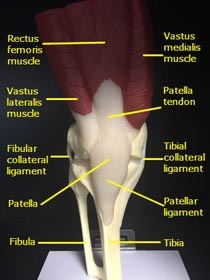 Subtle weakness in the gluteus maximus and medius leads to internal rotation of the femur with running or walking. We may not notice a difference in our own gait, but our knee ligaments, tendons, and muscles are feeling the difference. 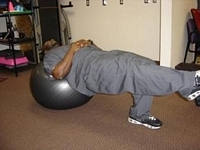 Hip strength and stability is very important in knee movements and protecting the cartilage, ligaments, and meniscus.